Breast cancers are as diverse as the women who have them. Now experts are using gene-based information to tailor treatment. In the 1950s, breast cancer was treated as though it were a single disease, with a "gold standard" therapy — radical mastectomy, followed by radiation. Even that harsh regimen didn't always prevent recurrence of the cancer, and by the 1970s, cytotoxic chemotherapy had been added to the mix — powerful drugs that kill rapidly dividing cells, both cancerous and normal. That, too, had a price: nausea, hair loss, numbness, and "chemo brain." The one-size-fits-all approach wasn't due to medical ignorance. Researchers had long suspected that breast cancers aren't all the same. Some, they believed, could safely be eliminated by surgery alone; others might respond to hormone treatments; and a few might need chemotherapy. But no one knew which tumors would respond to which treatments, so all breast cancer patients were treated the same way — aggressively. Now, thanks to advances in molecular biology, clinicians are better able to make those distinctions. Breast cancer research today is focused on identifying the specific genes and protein receptors that can distinguish resistant forms of breast cancer from those that are easier to eradicate. In the process, it's become clear that breast cancer isn't a single disease, but rather a collection of disorders that respond to widely varying treatments. It's been known since the 19th century that estrogen can fuel breast cancer growth. But it wasn't until the 1960s that scientists learned how: it locks onto a receptor molecule in the cell nucleus and turns on genes that spur cell growth. The discovery of estrogen receptors in breast cancer tissue led to the development of estrogen-blocking drugs like tamoxifen (Nolvadex). Tamoxifen not only cut the risk of recurrence in women with estrogen receptor (ER)–positive breast cancer but also became the first medical option for preventing breast cancer in high-risk women. A decade later, researchers identified another receptor, called HER2, which is the docking station for epidermal growth factor beta, another hormone that can spur breast cancer growth. HER2 is present in normal breast cells, but in about one-fifth of breast cancers, it's present in abnormally high numbers — an indication that these tumors are powered, in part, by high doses of growth factor. Like ER-positive tumors, HER2-positive tumors can be treated with a targeted drug. In this case, it's trastuzumab (Herceptin), which blocks the receptors and inhibits cell division. The addition of trastuzumab to standard chemotherapy has dramatically reduced recurrence rates and improved survival in women with HER2-positive tumors. All cancers are genetic diseases — that is, they're caused by mutations in DNA, the molecule that carries the instructions needed for the development and growth of cells, including cancer cells. Individual sections of DNA, known as genes, encode specific parts of the instructions, such as the code for synthesizing a certain protein. In recent years, scientists have discovered the genes responsible for at least some breast cancers. In 1994, for example, they identified BRCA1 and BRCA2. The normal versions of these genes produce proteins that repair DNA, but the aberrant forms (mutations), which were identified in women with inherited breast cancer, do not function normally, making DNA vulnerable to many kinds of damage. We have two copies of most genes, so women with an abnormal version of the BRCA gene also have a normal one that can take over the job of DNA repair. But 60% to 85% of these women eventually lose the function of the normal gene in breast tissue, and they develop breast cancer before age 70. The discovery of the BRCA genes has transformed medical approaches to prevention in women at high risk of the disease. Because the mutant BRCA genes are present in every body cell, they can be identified by a simple blood test. Women found to carry one of the harmful gene mutations have several options: screening via frequent mammograms and breast MRI, taking tamoxifen to reduce the risk of breast cancer, or undergoing a double mastectomy. Most women carrying a BRCA mutation opt to have their ovaries removed, because the harmful BRCA genes also raise the risk of ovarian cancer, for which there is no effective early detection option and for which surgery reduces risk by more than 90%. More recent research has linked breast cancer to several other mutated genes, including ATM, CDH1, CHEK2, p53, PTEN, and STK11. However, the degree to which these mutations contribute to breast cancer risk in the general population is unknown. Unlike breast cancer linked to the BRCA1 and BRCA2 genes, most breast cancer isn't hereditary. Gene mutations are involved, but they aren't passed down from generation to generation. Rather, they crop up when errors occur in the process of DNA duplication during cell division. Unlike inherited gene mutations, these errors don't appear in all of the body's cells: they're found only in breast tissue. A variety of environmental factors increase the risk. Some, like radiation, damage DNA directly; others, like aging, increase the number of cell divisions, thereby providing more opportunities for the cell's copying machinery to go awry. In breast cancer, two of the most common sites for genetic mutations are HER2 — the gene for the epidermal growth factor beta receptor — and microRNAs, which are tiny regulatory molecules that stimulate or suppress growth genes. In June 2009, researchers announced the discovery that another receptor, AGTR1, is overexpressed — that is, present in unusually large numbers — in as many as 20% of breast cancers. In normal cells, AGTR1 links to angiotensin II, a hormone that raises blood pressure and is believed to promote cell growth. The receptor is overexpressed only in tumors that are ER-positive and HER2-negative. Luminal A. These tumors are estrogen and progesterone receptor–positive and HER2-negative. Genetically, they resemble normal breast tissue more closely than other tumors, and they're associated with a low risk of recurrence. More early breast cancers are luminal A than any other type. Luminal B. These tumors have estrogen or progesterone receptors (or both) but in smaller numbers than luminal A tumors. Their genetic profiles are more abnormal than luminal A. They account for 8% to 15% of early breast cancers and are considered intermediate to high risk. HER2-positive. These tumors often have several other gene mutations that are associated with epidermal growth factor. They make up about 20% of early breast cancer tumors and are considered high risk. Basal-like breast cancers. These tumors are estrogen-, progesterone-, and HER2-negative — "triple-negative." They constitute about 15% of early tumors. Because they grow and metastasize rapidly, they are classified as high risk. Women with a BRCA1 mutation are more likely to develop these tumors than another type. They're often detected before they've spread to the lymph nodes and thus aren't flagged as high risk by the traditional classification system. Some cancer specialists are also using two new gene tests (MammaPrint and Oncotype DX) to further assess the risk of recurrence in women with breast cancer, to gauge how aggressively a tumor should be treated. 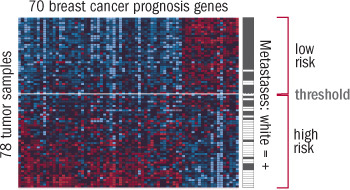 Both display the activity of breast cancer–related genes in a tissue sample. MammaPrint surveys 70 genes (see box); Oncotype DX, 21. The tumor is assigned a score based on the number of abnormal genes found, and this information is used to help calculate the risk of a recurrence within 10 years. MammaPrint may be used for women under age 61 whose tumors are confined to the breast; it requires fresh tissue from the operating room. Oncotype DX is useful for women with an ER-positive, lymph node–negative tumor; it uses "fixed" tissue kept after the tumor is analyzed in the lab. Above, each row is a breast cancer tumor; each column, a gene. The patterns of gene activity, or gene expression, shown above the horizontal threshold line indicate a relatively low risk of recurrence. In the rightmost column, white indicates tumors that metastasized within 5 years of diagnosis. Source: Based on MammaPrint microarray data; courtesy Agendia BV. to determine which women with ER-positive tumors are at high risk of recurrence and therefore likely to benefit from chemotherapy in addition to tamoxifen. to identify women with ER-positive tumors who carry certain forms of the gene for CYP2D6, a liver enzyme that helps metabolize specific drugs, including tamoxifen. These women do not metabolize tamoxifen as actively, and might do better with aromatase inhibitors, which effectively treat ER-positive breast cancers in postmenopausal women but don't rely on CYP2D6. PARP inhibitors for triple-negative breast cancer. These molecules interfere with an enzyme called poly (ADP-ribose) polymerase, or PARP, which repairs DNA damage. Although healthy breast cells have a number of ways to correct the errors that occur during normal cell division, cancer cells with BRCA mutations have lost one important DNA repair pathway and must rely more on a different pathway in which PARP is a key element. Drugs that block PARP allow DNA damage to pile up until cancer cells die, while leaving normal cells relatively unscathed. In two early studies, two different PARP inhibitors — olaparib and BSI-201 — significantly reduced tumors in women with advanced BRCA-related breast cancer (olaparib) and triple-negative metastatic disease (BSI-201). MicroRNA replacement therapy. MicroRNAs are small regulatory molecules that work by preventing the production of proteins that stimulate growth in certain body tissues. In essence, they act as brakes on cell growth. MicroRNA levels are low in breast cancer cells, compared with normal cells. In June 2009, researchers reported that inserting microRNA into cancer cells shrank tumors in mice. This approach hasn't been tested yet in humans. Losartan. This drug is an angiotensin II inhibitor, currently prescribed for lowering blood pressure. It has been found to shrink breast tumors with high levels of AGTR1 receptors that were transplanted into mice. The treatment hasn't been tested yet in humans. MammaPrint or Oncotype DX analysis. In women with ER-positive tumors, these tests can help determine whether to add chemotherapy to tamoxifen therapy. CYP2D6 testing. This test is only for postmenopausal women with ER-positive tumors. Women with a defect in the CYP2D6 gene have a fourfold greater risk of recurrence after tamoxifen treatment. This test can determine whether aromatase inhibitors should be substituted for tamoxifen. Multi-gene classification for women with triple-negative tumors. Several tests can help determine the most effective drug treatment by providing a tumor's genetic profile. For example, if the tumor contains a high number of epidermal growth factor receptor (EGFR) genes, it might be helpful to prescribe cetuximab (Erbitux), which blocks EGFR. For women with early breast cancer, the reassuring message is that targeted therapies are now state-of-the-art, and advances in gene-based treatments are accelerating. Each improvement brings us closer to the day when targeted therapies can score a bull's-eye.